Users are getting below error, while trying to connect to the database. The error occurs , because the mount point where audit logs are written is filled. We can see that mount point is filled, so database is not able to write audit logs in adump location. To fix this, clear space from that mount point And make sure free space is available for the audit logs. Once space is available, user can connect easily. Application log shows below error and users are unable to connect to the database. This error comes, when the archive destination is full and there is no space to accommodate new archive logs. There are different solution for this. OPTION 1: Try to delete old archive logs to free up space. In case you can’t delete the archive logs from existing location, then we can change the archive dest to a new mount point. After implementing any one of the solutions, the database may take few minutes to resume archiving and normal operation. Copyright (c) 1991, 2017, Oracle. All rights reserved. To find out the issue, Let’s check the content of the listener in listener.ora file. Inside the listener entry, we have 2 ADDRESS entries with same host(ram.doyen.com) and same port number(1524) . So starting the listener is failing with conflict. To fix the issue, give different ports for both the ADDRESS entries. Service "FRANCE" has 1 instance(s). Listener started successfully and listening on both 1524 and 1526 port. So in simple words, port should be unique for each ADDRESS entry of the listener. While creating a table using CTAS, got an error, ORA-01950: no privileges on tablespace ‘USERS’. This error comes, when the user the user doesn’t have tablespace quota. 1. Check the tablespace quota. 2. Grant some QUOTA to the user. Now we user FRANCE has 5G quota on tablespace USERS. Let’s run the same create statement. It worked. Now, check how much quota has been used. step 1. 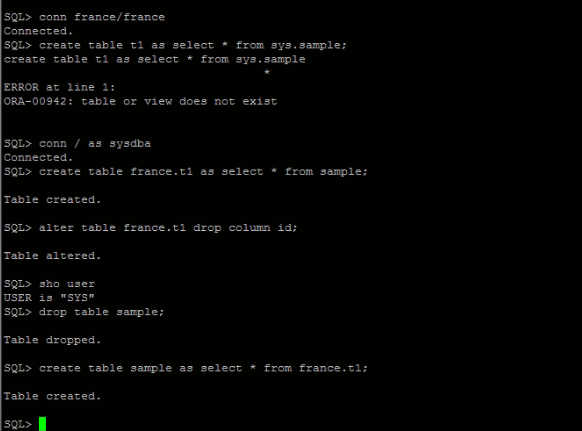 Create the table under different schema(using CTAS) let’s say DBACLASS user. step 4. 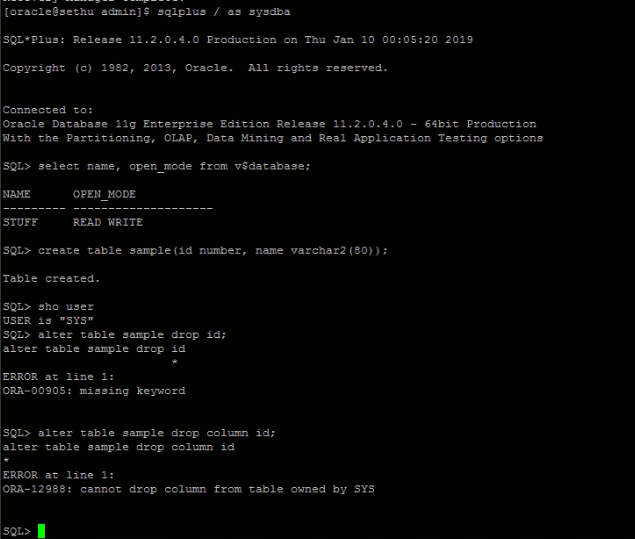 Again create the table using CTAS from the dbaclass.test4 table. The export dump is an encrypted one. I.e while taking export , ENCRYPTION_PASSWORD has been provided. So for importing also, we need to pass the same password. So get the password and import as below. ORA-39035: Data filter SUBQUERY has already been specified.